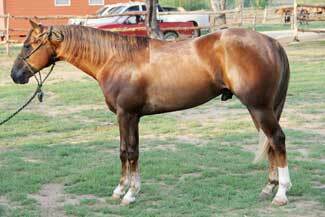 A really nice sorrel stallion with outstanding breeding. He would make an excellent reining prospect. His sire, JUSTA TWISTED WHIZ is a buckskin stallion sired by TOPSAIL WHIZ (LTE $53,868, 3rd NRHA Open Futurity, Lazy E Reining Classic Open Champion, Congress AQHA Champion Junior Reining Horse, Southwest RHA Open Futurity Champion, Dixie Nationals AQHA Reining Champion, AQHA ROM, NRHA Million Dollar sire, the NRHA's #4 All-time Leading Sire, 2001 NRHA and Equi-Stat #4 Leading Reining Sire, siring the earners of over $1,670,000 including WHIZARD JAC ($155,216, NRHA Open FuturityChampion, USET Championship Finals Champion, Congress Open Reining Futurity Reserve Champion, 3rd NRHA Open Derby, NRHA #1 All-Time Leaading Money Earner) and TOP GUN WHIZ ($147,817, NRHA Limited Open Futurity Champion and split 3rd Open Futurity). 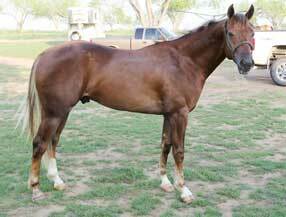 His dam has 1 registered foal sired by Mr Poco Blackburn 025, a bucksin stallion with 1 performing foal.